To my great delight, there were no soldiers or other patrons waiting so I literally walked in and had my new ID card made. Ten minutes later I walked out still in a good mood. As I’m prone to do, I remembered back to the day I drove down to the National Guard Armory in Chattanooga to get my first ID card made. Ryan had barely been commissioned and had yet to leave for his first training and we hadn’t moved out of our old house and old life just yet. There was much to learn about military life and so many new experiences awaiting us that I could have never dreamed up even if I tried. Little did I know the power of that card. Now four years–<< many more gray hairs, more bags under my eyes, and several more pounds >>– later, I have a new ID card and a much different outlook on what this little plastic card really is in the life of a military spouse. The ID card is everything in the life of a military spouse. It gets you on post, it gives you access to your healthcare, your benefits like using the commissary and may even offer you discounts around town. To the Army, as the spouse or dependent, I am basically nothing without my sponsor/soldier. This is a sobering, frustrating and humbling thought. At times it has been a struggle for me trying to figure out who I am and where my place is in military life. My roles and relationships shift and change. Just as I may get comfortable wearing one hat, things change and it’s time to figure out a new normal and again, my role in that new normal. For many years, I found part of my identity in my profession as a teacher. I have found much of my identity in my friendships and my ability to be a friend. I have found my identity in my marriage and as a mother. I have found my identity in the places I have made my home. As life ebbs and flows (and as the military life demands), many pieces of our identity come and go as well. I am learning that saying goodbye to parts of yourself can often be a slow, but painful process. Days, months or even years go by before you realize what has been robbed ever-so-gently by the thief of time. Friends that once held a close place in your heart have faded away. Passions you once had haven’t had an opportunity to thrive so they, too, dim and tarnish. Getting my new ID card was an opportunity for personal reflection. Just as I realize that little pieces of who I am seem to come and go, ultimately, I was reminded that my true identity isn’t found in Ryan, my children, friendships, the Army or in pursuing any of my passions. My identity can only be found in Christ. On the days when military life feels difficult or hard, or the days feel isolating or lonely, I have to be reminded of this very fact. 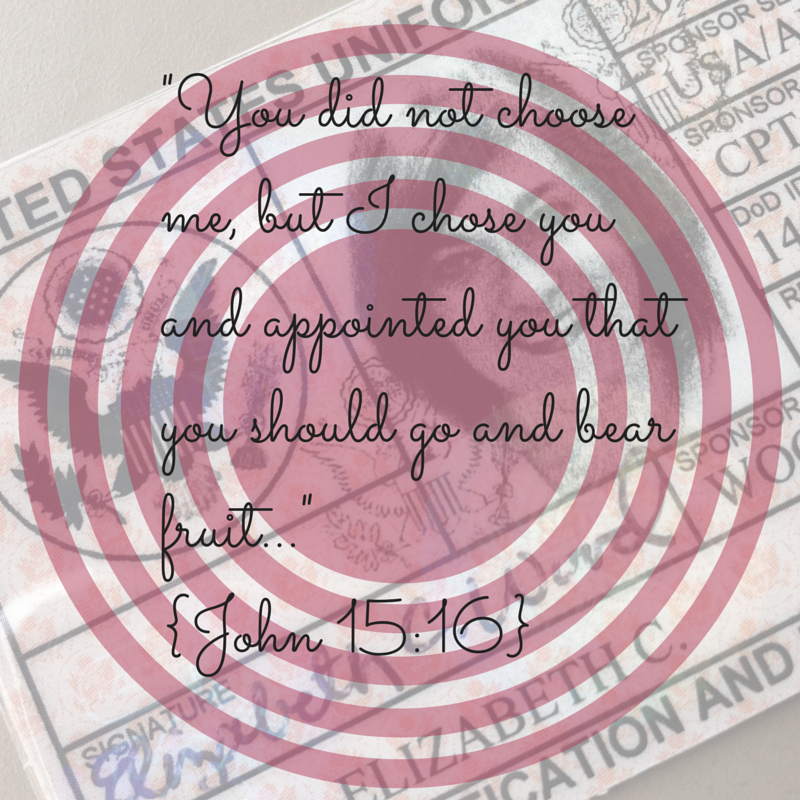 I am God’s chosen daughter; his own chosen child. He loves me at my best and at my worst. My identity in HIM grants me access to far more benefits than MWR activities and discounted groceries and decent healthcare. My identity in HIM is greater than any earthly pursuit or relationship could ever yield. My identity in HIM has no bearing on whether I am a good teacher, friend, mother or wife and how I hope others see me. My identity in Christ offers me a hope and a future no matter what the Army dictates. My identity in Christ offers me joy and gladness when I can’t seem to see the silver lining. 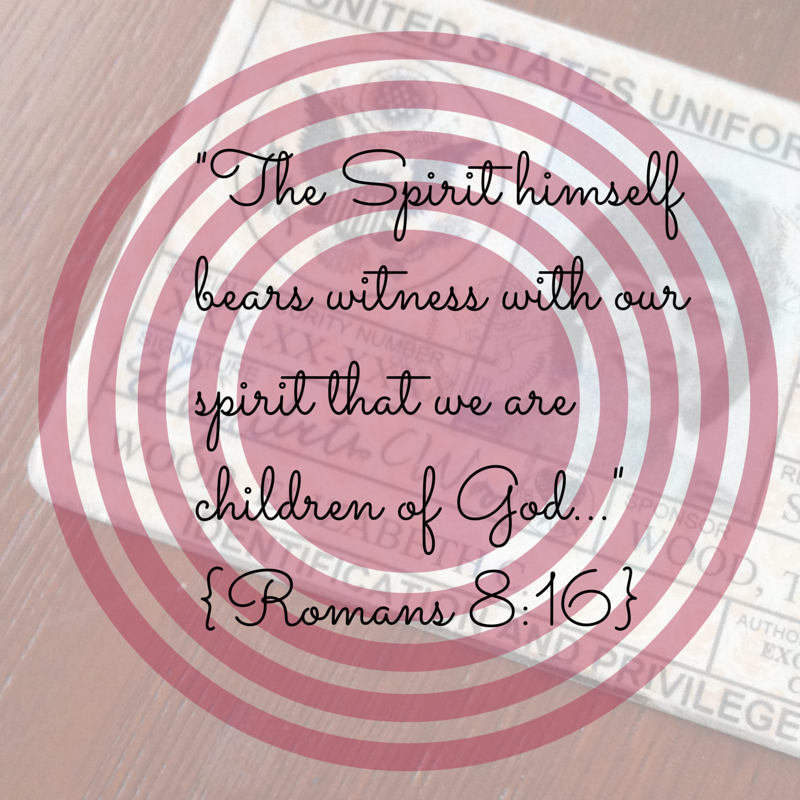 My identity in Christ offers me renewal and rebirth from a life of sin and death. Every time I pull this new card out of my wallet to gain access inside the gates of the installation or use it to get my 10% off at Lowe’s or Sonic, I am going to be reminded that while thankful for my “privileges,” that foremost, I am a child of God. The life he has called me to in this season is that of a military spouse and supporter of my husband and the U.S. Army. Knowing who I am in Christ allows me the grace to perform my roles dutifully and with greater joy. Have you ever gone through a period of time where you felt as if you were having an identity crisis? New job? New role at home? New city? Have you had a difficult time making sense of what that meant for you? I’d love to hear from you!